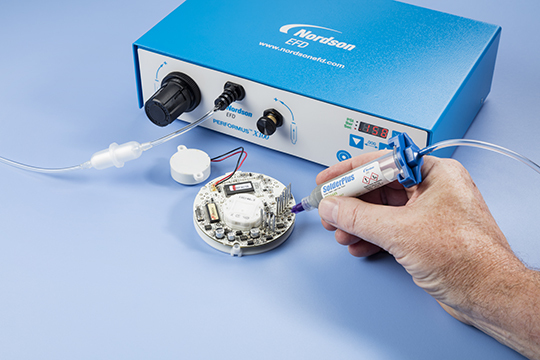 Nordson EFD, a Nordson company manufacturer of precision fluid dispensing systems, introduces Performus X Series fluid dispensers that deliver reliable benchtop dispensing control for general applications in the electronics, life science, consumer goods, and automotive industries. The new air-powered (or pneumatic) fluid dispensers reduce production costs and improve yields through controlled application of assembly fluids dispensed using syringe barrels and reduced operator-to-operator variability. The Performus X100 features a 0-100 psi (0-7 bar) pressure regulator for applying low- to high-viscosity fluids such as glue, oil, grease, silicone, sealant, cyanoacrylate, UV-cure adhesives, and dispensing paste such as SolderPlus solder paste. The Performus X15 features a 0-15 psi (0-1 bar) pressure regulator for greater control when dispensing low-viscosity or thin fluids such as solvents. The housing also acts as a faraday cage for improved EMI/RFI protection, and the unit features a chassis connection for grounding to shunt leakage current and enhance system electrostatic discharge (ESD) protection. In addition, both the Performus X100 and Performus X15 feature a Steady, Timed, and Teach mode of operation. The Teach function makes it simple to program the time required for the desired fluid deposit amount. Vacuum control keeps thin fluids from dripping between cycles. The dispensers feature digital time and pressure display, and can easily switch between psi and bar units of measurement. A comprehensive selection of replacement parts make the units easy to maintain and service in the field. Performus X100 and X15 also feature an I/O connection and universal power supply.